Benjamin Franklin wrote, an ounce of prevention is worth a pound of cure. When it comes to saving lives, Montgomery County Hospital District knows how true this is. Minutes count in heart attacks, choking and other potentially deadly incidents. The people who are in the room when something happens are the difference for that person. At MCHD, you are that ounce of prevention. Whether you want to learn CPR, how to stop the bleeding from a major cut, how to put in your child’s car seat correctly, or just being prepared when babysitting, Montgomery County Hospital District has the answer. Montgomery County Hospital District offers a range of classes designed to equip county residents on a number of life saving tips and tools that will help save lives by being the first to step up and help someone in distress. 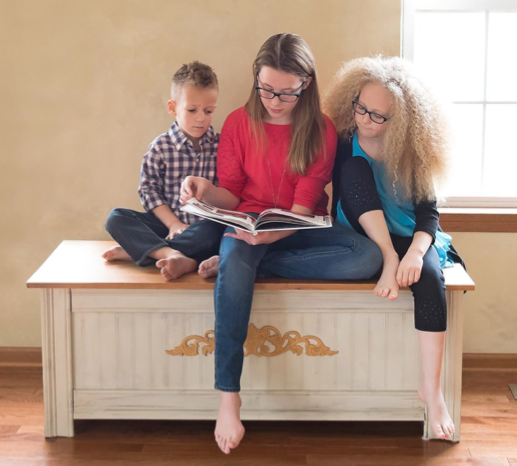 MCHD’s one-day Safe Sitter course is designed to prepare students in grades 6 through 8 to be safe when they are home alone, watching younger siblings or babysitting. This seven and one-half hour instructor-led class is filled with fun games and role-playing exercises. Students even get to use manikins to practice rescue skills like choking rescue and CPR. Class fee is $60, which includes American Heart Association Heartsaver CPR/AED certification. Students should bring a sack lunch. Remaining summer Safe Sitter Classes will be offered on the Saturdays of August 12 and August 26 from 9:00 am to 4:30 pm. Fall Safe Sitter classes will be posted soon. Need to know a little of everything? The district’s monthly Night of Life class is a free three-hour educational program focusing on hands-only CPR, training on how to use an Automated External Defibrillator (AED), response to choking education, and bleeding control training. 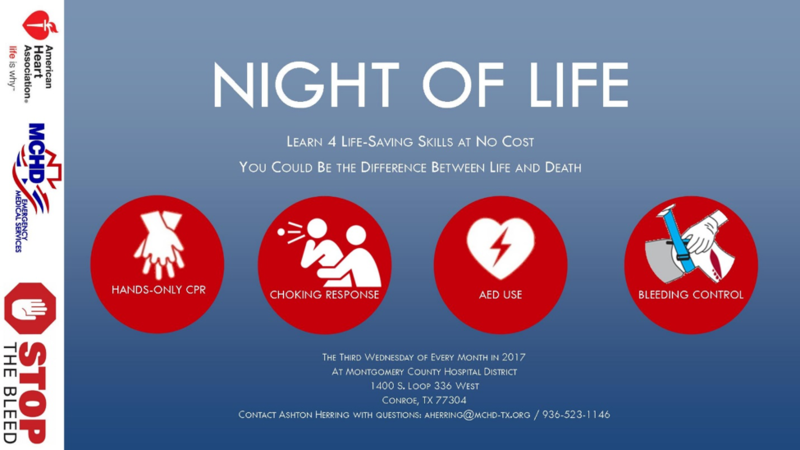 Night of Life classes are held on the third Wednesday of each month at 6:00 pm at Montgomery County Hospital District’s offices located at 1400 South Loop 336 West, Conroe. Car seats are the law but they also make good sense. Motor vehicle crashes are a leading killer of children, and the latest research from the U.S. Department of Transportation’s National Highway Traffic Safety Administration (NHTSA) shows that 59 percent of car seats are misused. MCHD offers inspection of car seats every Wednesday morning that includes lessons on how to choose the right car seats for children, install and use them correctly, and register the seats so parents and caregivers will be notified if there is a recall. A reduced cost car seat program is also available for qualifying caregivers. Locations may vary. Appointments are required. Please go to www.MoCoKids.org or call 936-523-1146 for your appointment. To register your child for the monthly Night of Life or the one-day Safe Sitter Class, call Ashton Herring, First Responder and Outreach Coordinator at 936.3523.1146, email her at aherring@mchd-tx.org or register on our website www.mchd-tx.org/calendar-of-events/. 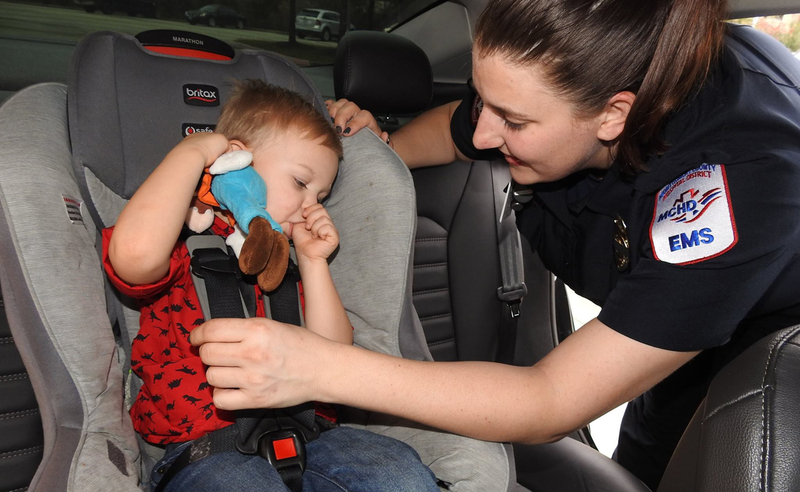 Night of Life, Safe Sitter and Car Seat checks most often take place at the MCHD offices at 1400 South Look 336 West in Conroe. Check our calendar of events at www.mchd-tx.org to find out if the one you want to attend will be held. Montgomery County Hospital District’s mission is to care for the indigent and provide EMS services while protecting the interests of the taxpayers and insuring long-term stability through fund development. To accomplish this mission, the board members and staff of MCHD follow the values of accountability, compassion, excellence, innovation, integrity, and unity. For more information about MCHD, visit our website at www.mchd-tx.org or call 936-523-5000.